We stayed at this facility for three nights and found it acceptable. The site where we stayed we a pull through, adequately accommodating our motorhome. Most of the campers were snowbirds from all over the country and Canada. The park is across the street from the beach, and within walking distance of some nice restaurants. Nice sized dog park for your pet to play, and a nice fireplace to enjoy during chilly evenings. We definitely would stay here again if we find ourselves in Biloxi in the future. Nice quiet campground. Good sized sites. Friendly owners. Would stay again. Rude help in the office on weekends. Fellow campers had bicycle and cooler stolen. Shady people walking around that aren't registered there. Four of eight washers were broken in laundry facility. Cable wasnt clear it was fuzzy. Also, close to railroad. Would NOT recommend or stay there again. This was our first stay at the park. The spaces are nice but a little close. There are grass and stone parking as well as pull through and back in sites. 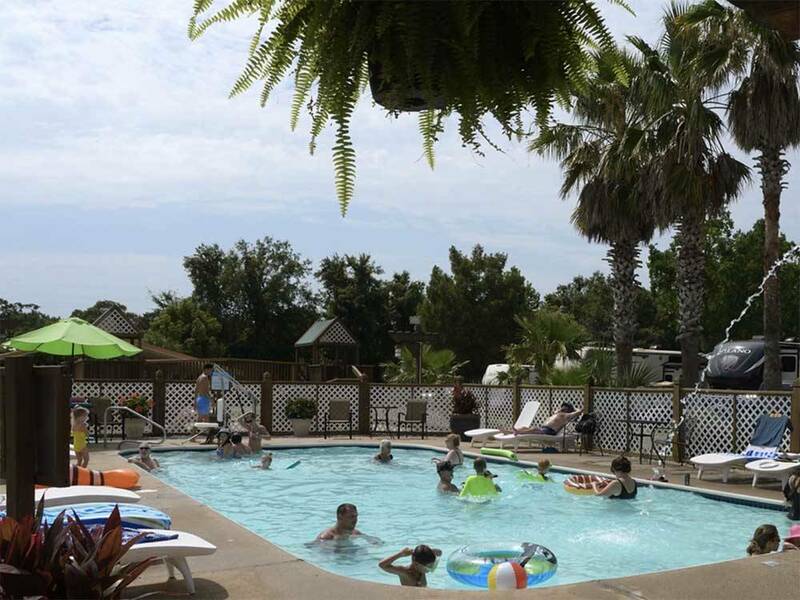 The common areas, pool, play ground, dog park, laundry room and bathrooms are well kept and clean. The park is across Highway 90 from the Gulf so the beach is right there. There are many restaurants in walking distance. Many things to do and see while you are in Biloxi. The only down sides and the reason we gave it 4 stars and not 5, was the park is located between a railroad track and Highway 90 so there is a noise problem with trains passing and heavy traffic at times. The other issue is to get to the park you must go west on Highway 90, so in reverse when you leave the park and want to go east you must find a turn around. This is a problem when you are towing a rig. We most likely will return for another stay next time we are in Biloxi. Great location, but can't get any sleep due to trains passing right behind the park with horns blaring at all hours of the night. Also, did not like how the sites are tightly packed. Your picnic table ends up a few feet from the next sites hookups, including the sewer line. We experienced a great stay at this park. Park security guided us in after hours. The sites, the bath houses and laundry facilities are top-notch. WiFi actually works all the time and cable TV is available. 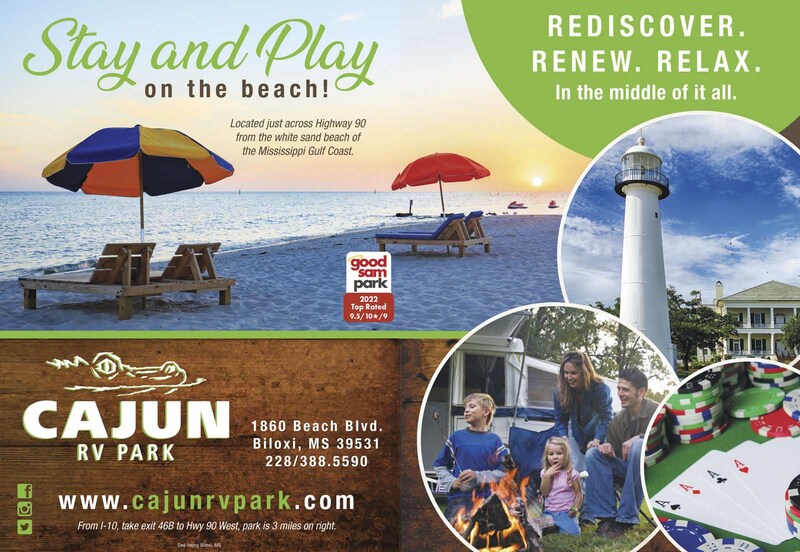 Cajun RV Park and Biloxi, MS are definitely on my must return list! Nice place across the street from the Biloxi beach. You can ride bikes or walk or run on the walkway for the length on the beach. GREAT food within walking distance of park.. you do not swim in the water at the Biloxi beach. Security vehicle made rounds every evening but never bothered anyone. Our bikes were out every day and night and left the campground when we did..
We just recently stayed here and were assigned a site in the front of the park closest to the road. We were disappointed with the amount of noise coming from the road and the music e could hear from the local establishment nearby lasting to late in the evening. We ere also awaken early in the morning by the workers next door moving large dumpsters with towmotors. If you book, I would suggest a site in the rear of the park. Reserved a pull thru for the night. Arrived a bit late but it was ready. Park is clean and you can see the gulf. Friendly gal this morning checked us out and gave me directions to get my RV back to I-10. If I go back, this is my number one place! Great job! This park was not as advertised. It stated no tents or clotheslines and only newer campers, which lead me to believe they had high standards. The people next to us had everything they owned outside the camper and had a tent up. We nicknamed them the Clampetts. Other campsites were kept just as trashy. There were empty beer cans under the bushes on our site and the table was filthy; we had to scrub it down as we were setting up. The staff was friendly and accommodating, but the facility itself was more in line with those we have stayed at for half the price; an overnight place, not one I would stay at for 5 nights again. We made an overnight stay here on a recent trip. We arrived after the office closed for the evening but the security guard showed us to our site and helped us get backed in. The park is right across the street from the beach and there are also several good restaurants nearby. When I went into the office in the morning to register, the office staff was very friendly. We like this park and plan on staying here again in the near future. There arent enough words or enough space for me to explain how wonderful these folks are. We were supposed to be there for one night, and due to Motorhome problems we had to stay for 4. They never blinked or acted like it was a problem when we had to keep telling them we couldnt leave. The park itself is great, good size spaces, everything worked and a great dog park. Everyone there has dogs, most more than one dog and I know mine were not on their best behavior and everyone went out of their way to great them! Even when they were barking. It has a great fire pit lit everynight. I can see why people stay there long term and return each year. Cajun RV truly was a blessing for my family on what turned out to be an RV owner nightmare with everything failing on our coach. Its also close to the beach, restaurants and casinos. Walk to beach! Many big sites. Several places to eat you can walk to. I plan on going back again and stay longer. Park was convenient to all the tourist attractions. Roads were good, grass sites available, and pet-friendly. We had a grass site, and were adjacent to a pavilion and the large gas fire feature. The pool was nice and laundry facility decent. We would stay there again. Stay 3 nights and get the next night Free!! Stay 3 nights get the 4th night Free! Offer is based on availability and not combined with any other discount. Higher daily rate prevail first. Holidays and 'special events' excluded. From Cajun RV Park everything is from 1/2 to 12 miles away! World class casinos, pet friendly white beaches, dinner cruises, charter boat fishing, fabulous restaurants, first class golf courses, a water park, historical homes tour, outlet shopping and museums. All just minutes away!